Eurolock EHT Net is the RFID reader and controller powered by 3 AAA-size 1.5V batteries; battery life time is more than 50 000 cycles (4 years max). After installing Eurolock EHT Net over the mechanical lock of DIN standard, access to your door become electronic. It's necessary to bring the RFID key to lock reader for open the door from outside and it's enough to turn the door handle for open the door from inside. 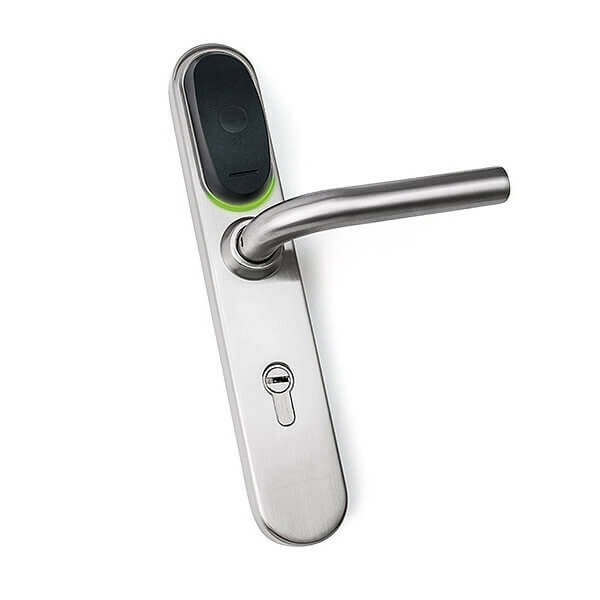 The installation procedure of Eurolock EHT Net is the unmounting of old door handle and easy installation of Eurolock EHT Net with two screws on the door leaf instead of old door handle. Originality of Eurolock EHT Net is the possibility to use it on almost any existing door and a cost of installation and connection is 10 minutes. Applying of Eurolock EHT Net allows you to create flexible access control system both the network mode via RS-485 network using software and the standalone mode using a master key for locks configuration. Office mode — the lock can be opened by keys saved in the lock controller database only. Features: free passage mode, blocking mode, switching the state open-closed by the internal clock of the lock. By using specialized software on the access card can be set additional restrictions on the time and day of the week. Hotel mode — it is intended for hotels, hostels, student campuses etc. It's allows you to create guest keys, staff and special-purpose keys with specific access rights and copying protection.